Of Puerto Rican and Irish descent, Alvarez was born and raised in Kensington, Philadelphia, a rough neighborhood with a reputation for violent crimes and an abundance of street narcotics. Known in MMA for his boxing prowess, Alvarez was a wrestler at Northeast Catholic High School. He was a two-time National Prep All-American, and placed 6th in both 2000 and 2001 at the National Prep School Wrestling Championships in the 145 lb weight class. 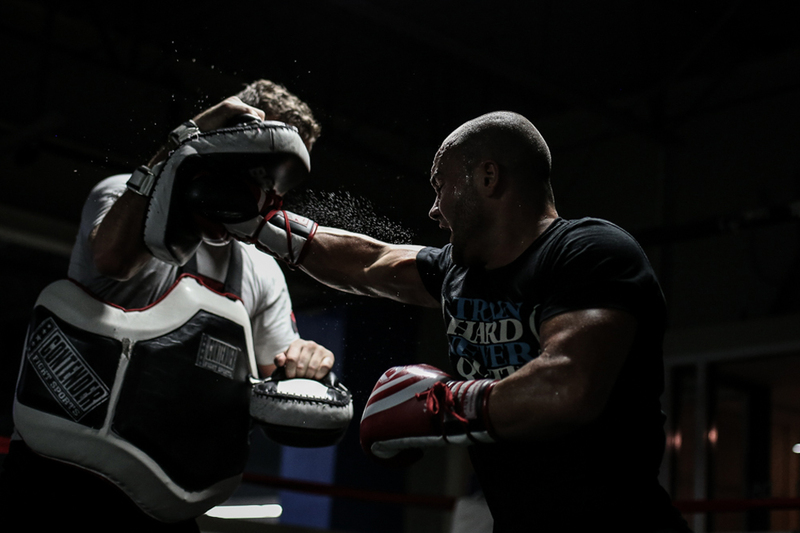 After high school, Alvarez immediately pursued a professional career in MMA with his first fight coming after only eight months of formal training. Alvarez utilized the financial success to move his family out of Kensington and into Northeast Philadelphia following the birth of his first son, Eddie Jr.
Alvarez made two appearances on the television show Bully Beatdown on MTV, where he knocked out both of his opponents. Alvarez in December 2010, opened up the first ever MMA store in Philadelphia, PA. The name of the store is, “The Red Corner” and was located in the Fishtown area of Philadelphia, and has since shut its doors. Alvarez won the MFC welterweight title in his seventh pro fight in June 2006 when he defeated Derrick Noble via KO at just 1:01 of the first round. The MFC welterweight title would later be re-branded the BodogFIGHT welterweight title. In spite of the fact that many insiders didn’t view 170 pounds to be Alvarez’s best competitive fighting weight, he continued to fight larger opponents because he relished the challenge of testing his mettle against bigger fighters. At Bodog Fight’s “Clash of the Nations” pay per view in Russia on April 14, 2007, Alvarez’s size disadvantage would be exposed, as he suffered his first career loss when he was TKO’d by UFC veteran Nick Thompson at 4:32 into round 2. After deciding to leave Bodog, Alvarez quickly found a new home in EliteXC where he competed in their 160 pound division against Ross Ebanez, winning by TKO. A few weeks prior to the first event, it was announced that the upstart Japanese promotion DREAM, started by the minds behind PRIDE FC and K-1 had signed Alvarez to compete in their 154 pound grand prix. His initial fight was against Andre Amade, another potent striker, hailing from the notorious Chute Boxe Academy. During the fight, Alvarez was dropped by a strong right hand, but was able to recover and use his superior wrestling skills to score a TKO due to strikes from mount late in the first round. Alvarez advanced to the second round of the tournament where he defeated top ranked lightweight fighter Joachim Hansen on May 11, 2008 by unanimous decision in an exciting fight. Hansen, who was known for his ability to take a punch, was dropped twice in the fight and dazed numerous other times by Alvarez’s strikes. In his fight at DREAM.5, Alvarez knocked out top ranked lightweight fighter Tatsuya Kawajiri in the tournament’s semi-finals. The fight was awarded Fight of the Year by Sherdog for 2008. However, he was unable to advance in the tournament due to a cut and severe swelling under his right eye. Alvarez’s replacement was Joachim Hansen, whom he defeated two months earlier. Hansen went on to win the tournament and capture the DREAM lightweight title. Alvarez was scheduled to face UFC and PRIDE veteran Nick Diaz for the EliteXC 160 pound title on November 8, 2008. but that fight was scrapped when EliteXC’s parent ProElite closed its doors and filed for bankruptcy. On New Year’s Eve 2008 Alvarez fought against Shinya Aoki at K-1 Dynamite!! 2008, losing by submission in the first round. He has since been signed to an exclusive contract with Bellator Fighting Championships.